My love affair for Gran Fondo Strade Bianche is no secret. Each year from its inception in 2016 I’ve merrily returned home with trinkets, tassels and treasures. I am in no way affiliated with the event, but ever since I heard my name over the loudspeaker from the pasta party for the winner of a Kask helmet, my loyalty has not wavered. I am an improved person thanks to the race, most notably the 2017 edition which is how my Jakub and I became an item. Needless to say, the Gran Fondo Strade Bianche has a special place in my heart. Expanding the success of the autumn’s Eroica event, in 2007 Strade Bianche Eroica Pro put its stake in the ground with the vision of joining the most prestigious spring classics: Paris-Roubaix and Tour of Flanders. But no party is much fun without women and a bunch of hooligans, so they added the Fondo and a women’s race, too. 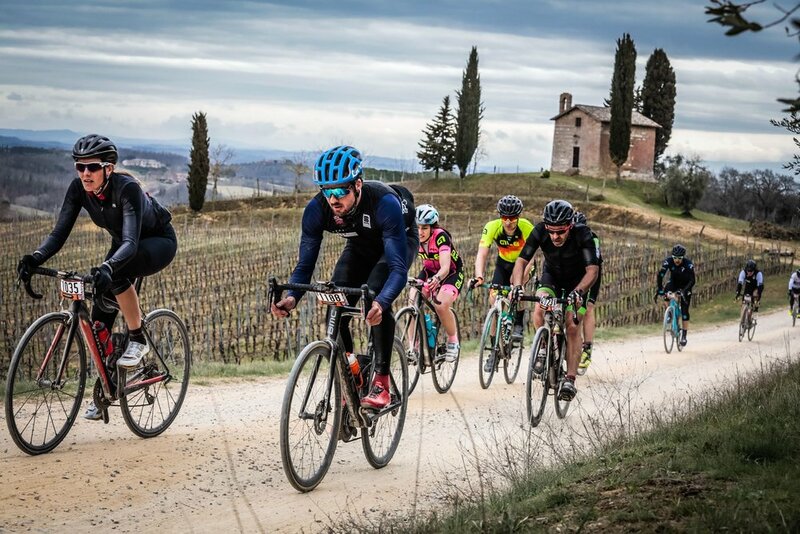 So what kinds of joy can Gran Fondo Strade Bianche bring to your life? Well, I promise these unpaved white roads are nothing near as torturous as riding Belgium’s pave. Let’s dive right in! Opening up the weekend’s activities is the pro race giving you a front row seat to the suffering and drama that, of course, isn’t your own. The men and women ride close to the same course, and if the weather gods aren’t angry, then you’ll be off to the races. Now, carefully considering the big race day is on Sunday, we wouldn’t want to overextend ourselves. And overextend ourselves we shall not do. In as few as 75km, you can access reality armchair viewing of both the men and women directing your tips and words of encouragement at the rider rather than a tv or computer screen. Many aggregate on Via S. Caterina, the final climb to the finish in Siena’s Piazza del Campo, which may interest you if your weakness isn’t large crowds in confined spaces. Otherwise, take a look at what awaits in mother nature. First tick box on the itinerary is San Martino in Grania to see some of the worlds most consistently dominating cyclists like Annemiek van Vleuten and Marianne Vos. Since we’re all a bunch of amateurs, let’s embody it to the fullest and mosey on over to Asciano for lunch. The town of Asciano is dead centre of the Crete Senesi and Tuscany’s most spectacular beauty. You’ll have enough time to devour a primo piatto and a gelato before time starts ticking. Now for Monte Sante Marie— an iconic section of l’Eroica is the next place to be to catch the pro men and their entourage. It’s a jaw-dropping section of white roads and your only chance to ride it this weekend. As for other matters of importance, let’s talk about Siena, one of the most beautiful towns in Italy. The Gran Fondo Strade Bianche starts and finishes in Siena and is essentially hijacked by cyclists for the weekend. What better race fuel than cinghiale (wild boar), Cinta Senese, papperdelle & pici pasta and cantucci biscuits— all Senese specialties? With possibly even a Sagan sighting— it’s a cyclists delight. Nuff said. Starting amongst 5000 people— a few in aero suits, deep dish carbon wheels and others with power meters and glossy, “embrocated” legs might feel a little intense for a gelato-eating, wine drinking amateur like yourself. But trust me on this one, if you can tame your emotional reaction for the first 30km and let frantic cries of “attenzione!”, “destra!”, and “sinistra!” become a stoic practice, you’ll finish in an abundant positive. The 139.2km Gran Fondo Strade Bianche course follows the women’s pro race circuit with 31.4km of gravel or the just as beautiful Medio Fondo at 86.6km. Events like Gran Fondo Strade Bianche and l’Eroica are to preserve Tuscany’s gravel roads. Significant efforts go into filling holes and keeping the white roads in tip-top shape, meaning you can easily carry speed over them. A gravel bike is not a must, but good 25 or 28mm tires are. If it wasn’t for the charm of the Gran Fondo Strade Bianche itself, races and events bring people together. It might be that you’ll see a guy (or gal) walking towards the coffee bar you’re in, wearing bright green running shoes. In a country where sports clothing is only worn for exercising, it’s enough to evoke the curiosity of who this guy is and where they’re from. How about joining Lucca Cycling Club in early March for the 2020 Gran Fondo Strade Bianche? Wearing our club colours means guaranteed registration to an event that sells out, a stress-free experience and us cheering for you. Sign up to be notified first.